As I reflect on the past several years, I’m realizing how many career lessons I actually learned in my 20s. If I’m being honest, I’ve probably taken a little bit more of an irregular route than most college graduates, but I’m totally ok with that because I feel like I’m finally finding my stride in life. No matter what your current career status looks like, I hope these career lessons will be helpful for you and make your 20s (or 30s or 40s and beyond) feel more meaningful. For those of you who aren’t familiar with my background, I began as an Advertising/Public Relations major, then switched to be a human services major after three years. I got my degree in that and then went on to get my master’s degree in psychology. After working in the social services and education fields for several years, I now work in influencer marketing. The reality is that if you burn out from your original career path or just don’t love it anymore, there are other options out there. Sure, you may need to work to make the switch and demonstrate your ability to handle the move, but it’s absolutely possible! Besides, your happiness matters most at the end of the day. I had never been familiar with side hustles until I started this blog just over three years ago. To be honest, I didn’t think that starting a blog was going to be as challenging as it ended up being. There were many times I felt like quitting, but I kept pushing forward (and I’m so glad I did). Not only have I learned new skills like HTML, managing a WordPress site, and marketing on social media, but I’ve also become better at managing my time and interacting with people via email. Side hustles are often self-taught practices that force you to learn all the ins-and-outs yourself. It’s a true testament to your patience and determination to get stuff done, that’s for sure! No matter how much you enjoy your job, there will always be something that happens that makes you feel frustrated. Rather than going off on a coworker for messing up or being mad for the rest of the day because you were assigned an almost impossible deadline, it’s important to channel your frustrations into something more productive. For me, working out is my go-to stress reliever. Five days a week, right after I log off from work, I go straight to my living room and workout for 30-60 minutes. By the time I’m done, my head feels clear and I can go about the rest of my evening without all of the frustration I was feeling earlier. One of the biggest career lessons I learned in my 20s is that my career isn’t the definition of who I am as a person. Sure, I mention to people that I work in influencer marketing as a project manager, but I also share where I’m from, things I enjoy doing, and aspirations I have. Your career is only one puzzle piece of what makes you, you! Yes, it’s a big piece at that, but it’s not the defining factor. Don’t lose sight of that. The world is becoming smarter and smarter. Job descriptions are constantly changing as new technologies become available, and it’s important to stay on-top of these trends because the tools we use today could be obsolete in a decade. This is why it’s crucial that you be a lifelong learner. Even if you don’t have required continuing education hours to get, I highly encourage you to take an online course, start a side hustle, or attend conferences in your field. It’s really easy to come to the table and name everything that is wrong with a system. The challenge comes when you flip the script and create solutions for the things that are wrong. This often requires some creative thinking and brainstorming. It may even mean stepping outside your comfort zone and thinking forward so that you can present a better solution to your boss or team. Companies like have solutions-oriented workers because they can help create smoother and more efficient processes, which often leads to happier employees. I took the StrengthsFinder test in early 2016 and instantly became more aware of what I bring to the table, and how those strengths can best work in tandem together. In my own results, Achiever was at the top, which wasn’t a surprise since I’m the queen of to do lists and I get great satisfaction from accomplishing things. My boss and coworkers also know what my strengths are, and this helps them better communicate with me. It also gives them insight into where I might shine when problems arise. If you haven’t taken a personality or strengths assessment, I highly encourage you to do so! If you haven’t already, I promise that you’ll have some days where you wake up and flat out do not want to do anything. Work will seem like a never-ending run that you’ll never get through, and you’ll feel defeated before you even walk through the doors. To get through these times, it helps to create small goals for yourself. I recommend starting with three things and writing them down on a notepad. 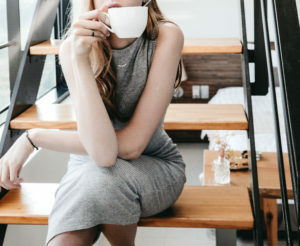 This will help you focus on the things you need to get done, and give you achievement milestones that can be celebrated with a trip to the break room or a quick walk. Sitting at a table full of people, especially those with higher titles, can be extremely intimidating. I remember being in one of my previous jobs and having this one coworker who often ran the meetings and gave her insight. I noticed that most of my peers who were sitting at the table would shake their head in disagreement, but they never spoke up or said anything that was on their mind. I finally got up the courage to share my views on the issues being presented and offered some solutions. I think everyone was shocked to hear someone else talk at first, but slowly but surely, my peers started sharing their views as well. Sure, not all of my ideas were feasible or able to be put into action, but it felt good to be heard and to show my superiors that I do listen and want to contribute to the success of the company. Of course not every meeting may be the right time to do this, but I encourage you to find a time that is! Finally, if not most importantly, learn how to balance your work life with your regular life. We live in this culture where work is everything because without it, we can’t pay bills or live comfortably. Although this is true, there is nothing more important than your relationships, your own self-care, and finding enjoyment in life. Make it a point to balance the two early on because if you don’t, you risk burning yourself out. 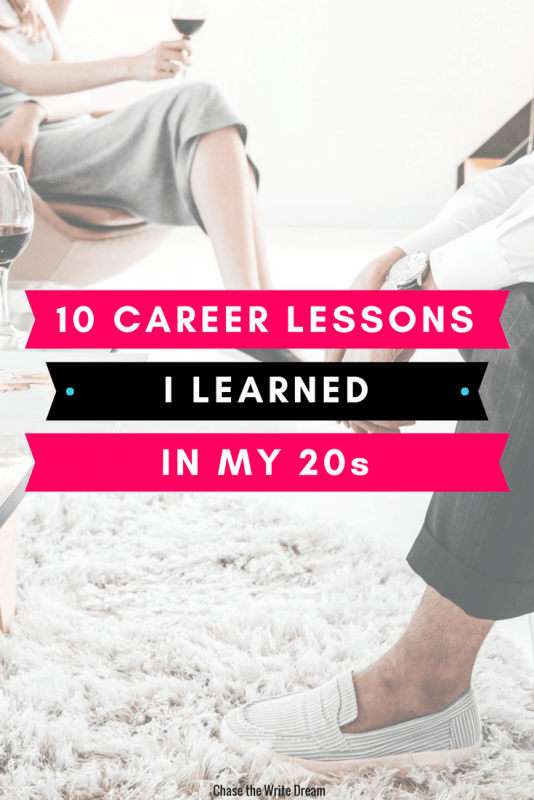 There are many other career lessons I learned in my 20s, but these are the ten that stood out most. Do you have any you’d like to share? Were there any that hit home for you? I’d love to hear your thoughts in the comments below.